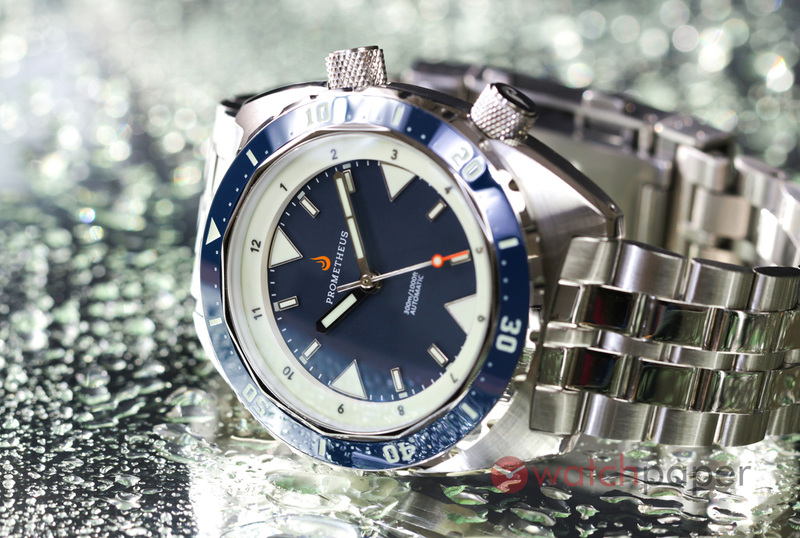 Prometheus Watch Company was established in Portugal in 2008. They are inspired mostly by the good old mechanical timepieces of the 1960s and the early 70s but above all, they are about creating wristwatches using modern and fine quality parts. As a microbrand, that means they are using the best elements they can find from Portugal, Germany, Switzerland, China and Japan while keeping their products at an affordable level. All this information can be found on their webpage as well as the fact that this year, the company is celebrating its 10 years in business and on this occasion they’ve launched their ultimate affordable piece. 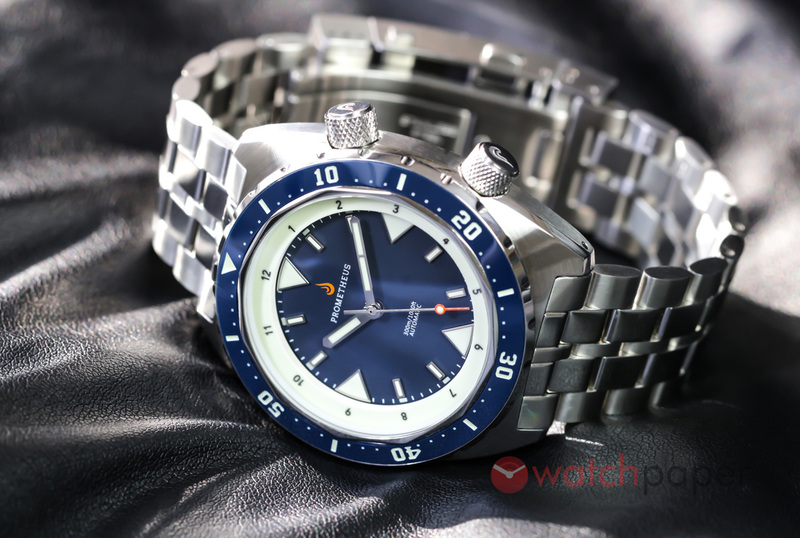 They have sent us a prototype of the anniversary Prometheus Eagle Ray to prove that you can have a finely made, great quality diver watch that can even match an Omega or a Panerai at a very reasonable price. Let’s see how this mission was solved. Starting with the case, the watch is 42 mm wide, without the double crown. From lug to lug it is 49 mm long and 14.75 mm in thickness. Our first thought was connected to the early Seiko chronographs, but this form was used by Heuer, or the modern Doxa as well. 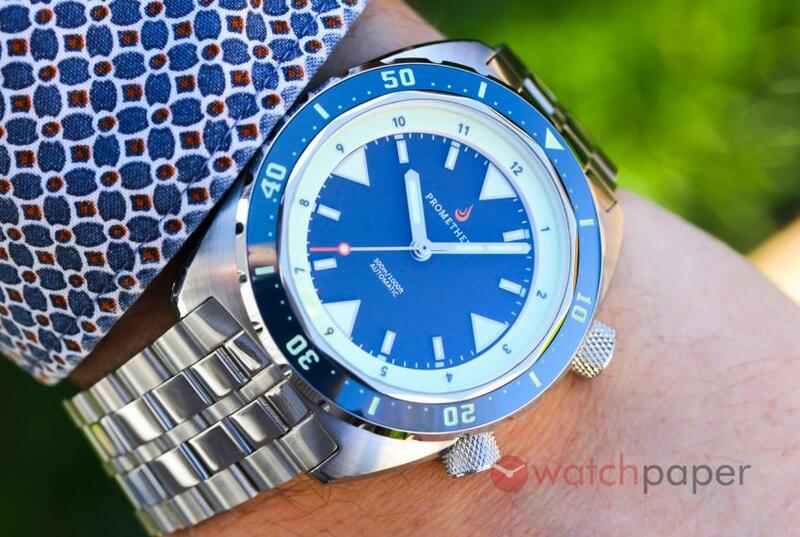 The Seiko Padi shape is similar and we are sure you can mention some more brands that used this style before. 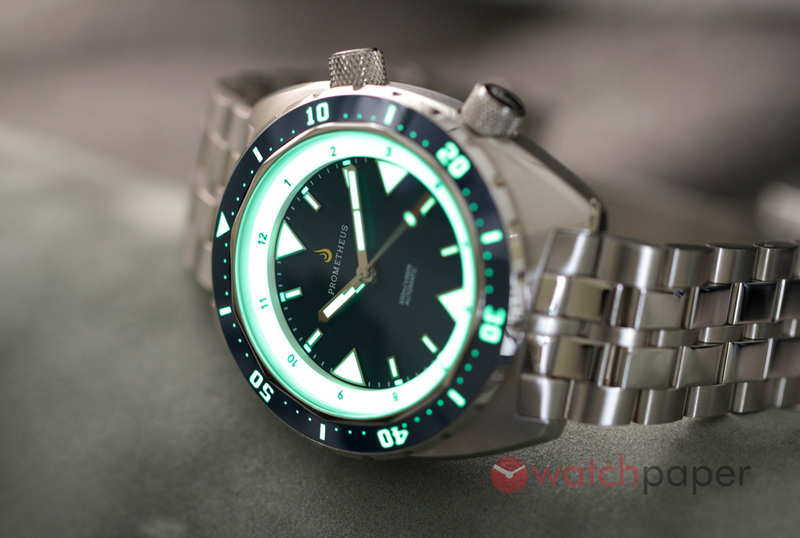 But we are also pretty sure there are much more brands out there using the round or square figure so this Eagle Ray won’t make you bored like those, in case you like this uncommon case shape. Continue from the lugs, you can find one of the highest quality stainless steel bracelets we have experienced from a microbrand ever. Complex, comfortable, good to wear and good to touch. Nicely finished, highly polished in the middle but brushed on the outer parts. The chain is connected with screwed links, what is really not usual from a timepiece you can buy for less than 555 dollars. The clips is a double pusher and well secured, with a quick adjusting feature at the end of it. Here another two small buttons help to length the bracelet with more than a centimetre in 6 steps, that is really good for divers but also practical when your wrist changes its size during a day. You don’t need any screwdriver to fit the bracelet perfectly, just push the buttons and set it right. 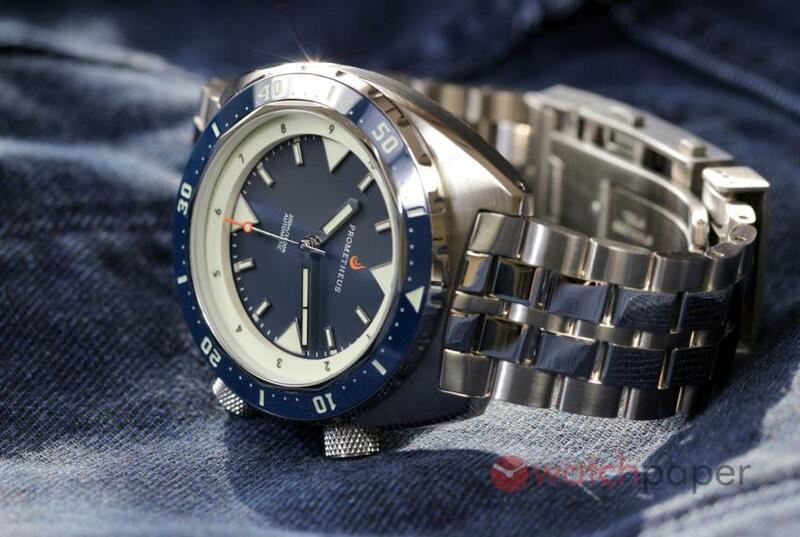 Of course, this option is familiar to those used to luxury brands like Omega or Rolex, but with an affordable piece, for that money and at this quality, it is something fresh and unique on the market. Around the dial, you can find a unidirectional ceramic bezel with 120 clicks and one more additional one but inside the case. The second crown at the 2 o’clock position rotates this second bezel left or right as you wish because the inner bezel is for the GMT complication. The Eagle Ray has got 17 different possible versions and depends on which you pick you can have blue, grey or black outer bezel, white, blue, grey, black or even meteorite dial inside and the so-called GMT complication. Besides that, you can choose date or no date variations as well. Actually, we should say “you could get” because most of the models are already sold out. A common feature in every Eagle Rays is the inner rotating bezel with 12 marks printed on it. With a GMT function, you can use this for what it was meant to be. Without the fourth hand, you decide how to use this feature. It can work as a not too common GMT as well but we have another idea. The outer bezel is for counting 60 minutes as we all know. But the inner one with the twelve indexes what mean hours, you just simply set its „12 o’clock” mark to the actual position where the hour hand of the watch is at the moment than you can count, not just 60 minutes but 12 hours from the actual instant. What is this if not a nice „manual chronograph”? The two crowns are screwed in, the watch is water resistant up to 300 meters. Both bezels, the rectangle hands and the indexes are lumed with Swiss made RC Tritec C3 X1 lume paintings. Inside the case, you can find the automatic Swiss made ETA 2824-2, not very common from a microbrand watch. Don’t forget this is the movement the high-end brands used very often some years before and some of them are using it nowadays too. It is really a workhorse from an established Swiss manufacturer and that means two facts. First, almost every watchmaker can repair or do the service for this and it is very easy to find replacement parts if you needed so. Second, this is a very accurate mechanical calibre if regulated correctly. 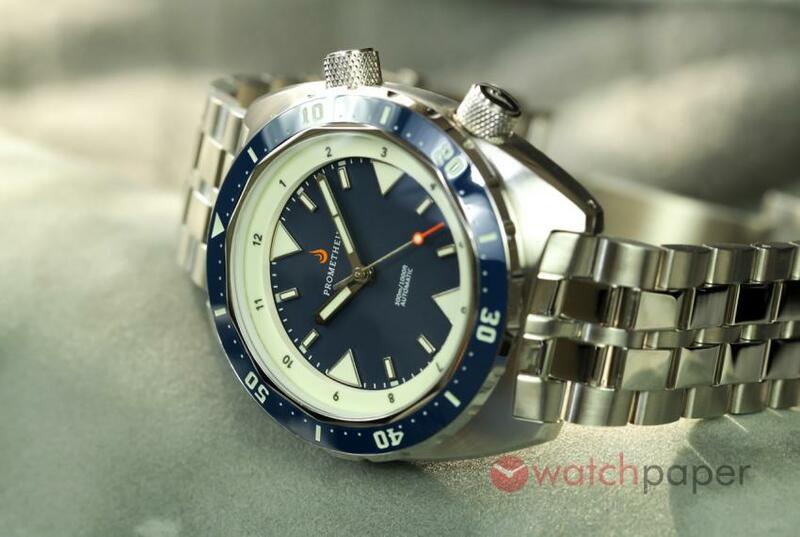 Way better than a Miyota or a cheap Seiko one ever can be and matching the Eagle Ray well what can be the real „flagship” piece of the Prometheus Watch Company if they will be ready with the production in Spring, 2019. 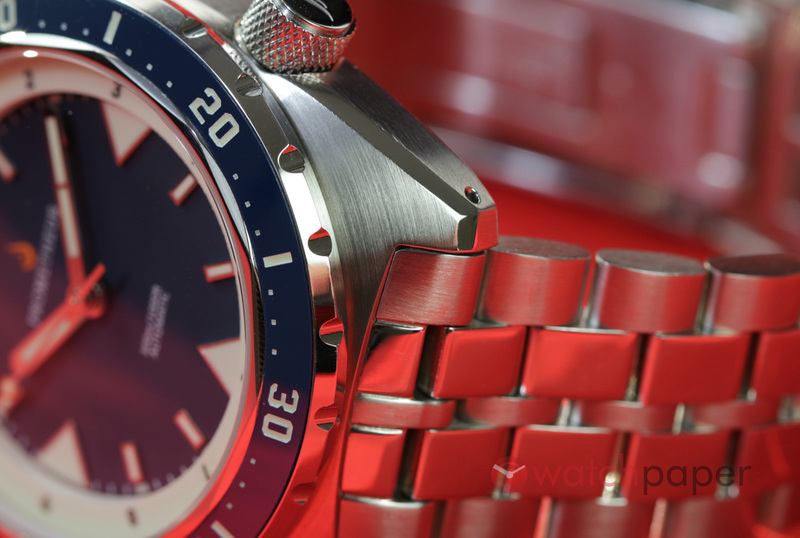 To put this review in context, let us summarize the whole experience with the Prometheus Eagle Ray and as promised at the beginning of this article, we’ll also do a final comparison with Panerai and an Omega Planet Ocean we wrote about before. First of all, let’s start with the style and look of a timepiece at a first glance. At this point the Panerai has got the strongest presence at least with the Luminor case because next to it an Omega diver or the Eagle Ray looks much more common or may we say more conservative. But of course not everyone likes the Panerai style, so this is just a matter of taste, but what is sure, the Prometheus has got as good quality as the mentioned luxury brands if we are talking about the material and the finish of the case. The brand with the Italian origin is connected to leather or rubber straps much more than stainless steel bracelets, but we all know that the Omega has very well made high-end, quality bracelets. And the Eagle Ray has got it really nicely done too. The screwed links are well polished and finished fine at an „Omega level” we can say. The quick setting claps are really cool and are working well. The whole bracelet looks and feels great. We also know that the Pams or the Omega POs got very strong and long lasting lume, but the Eagly Ray got it insanely strong and longer lasting, not joking. The inner bezel is something you may like or not. If you bought the GMT version it is useful, but without a GMT hand, it can be practical too. The movement of the Prometheus is not in-house, but the ETA 2824-2 is one of the best workhorse calibres on the market, for an everyday use it might its job just as good as a co-axial Omega movement. 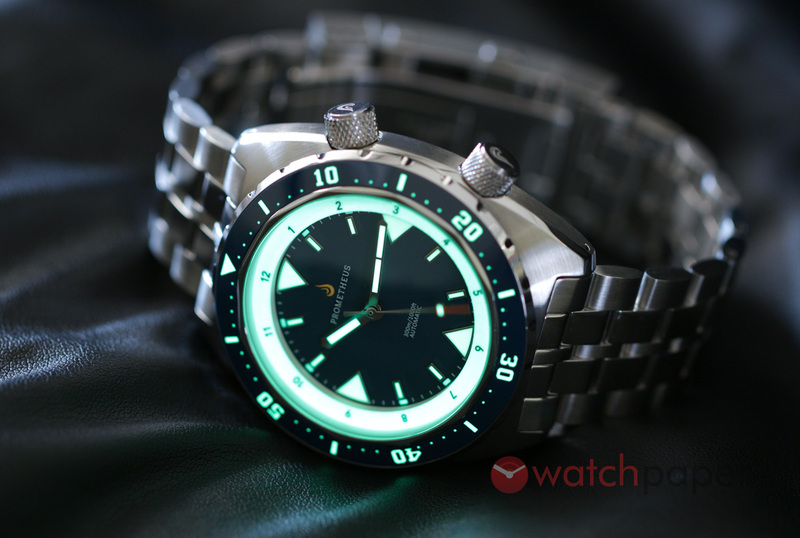 In a nutshell, if you are about to buy a good diver watch and you don’t care too much about the band name hype and besides quality, money is a deciding factor too, clicking the „pre-order” button of the Prometheus Eagle Ray can be a very satisfying decision of 2018.